A One-Month Social Plan Just for You! It seems easy enough, posting to social media, right? You do it every day for your personal account, so can’t you apply the same practices to your business accounts? Well, not really. When businesses reach out to us for help with social media, the number one thing they are looking for help with is what to post, when to post about that content and how frequent. If you fall in this boat, then you are in luck. On today’s blog, we are sharing a social calendar of ideas to help you post to social media. Before you post anything, first think of this: why are you sharing what you are sharing? With social media, you have the chance to reach over 2.872 billion people, so be strategic in what you are putting out there. If you have one chance to reach a new customer with your Facebook or Instagram post, are they going to understand what your business does from your post’s content? You want to have a mix of content on your social media in order to create variety in what you are talking about, establish yourself as an expert in your field and to build relationships with your audience. That is why you want to talk about content that is relevant to you and your business. Now, we aren’t saying don’t ever post about something if it isn’t related to your business, but for the most part, keep your content focused on your business or industry. Content can fall into a variety of categories. Here are the top categories we would recommend posting about throughout the month. 1). Personal. People connect with others when they share personal things with them. Now, we aren’t saying tell the world your secrets, but we are saying connect with others. Feature your team members, talk about what makes your business unique, share your brand values and so on. We find that personal posts get the most engagements because people like to support one another. So, go ahead and show your face around social media, literally. 2). Product / Service Knowledge. As a business, you either sell a product or a service, so make sure to let people know what it is that you exactly do. Each week, highlight one of your products or services to expose people to your company. This can be done through reviews, portfolio work or a simple Q&A about what you are wanting to feature that week. 3). Educational. Whatever field you are working in, you are probably somewhat of an expert. So, go ahead and share tips with your followers. Some people automatically assume that if you share tips, your competitors are going to take your information or copy you but that isn’t true. By sharing information that is educational, you eventually label yourself as an expert in your field. This is another door for people to find you and keep coming to you for industry-tips because they see you as an expert with the information you are putting out there. 4). Push. Whether you have a sale coming up or want people to sign up for your newsletter, ask people to do so. However, you will want to keep this spread out as not to bore followers by only asking them to do something or spend money with your business. 5). Fluff / Fun. Lastly, don’t forget to have fun! Social media has so many features (stories, filters, videos, hashtags and national holidays to name a few) that you can connect with others through many avenues. Not everyone wants to talk business 24/7, so throw a #NationalDonutDay post or “Happy Friday” up every once in awhile to break up your content and engage in trending social media posts. Now that you have a general outline of what categories your posts can fall into, follow our social calendar for what to post over the next 30 days to Facebook and Instagram. 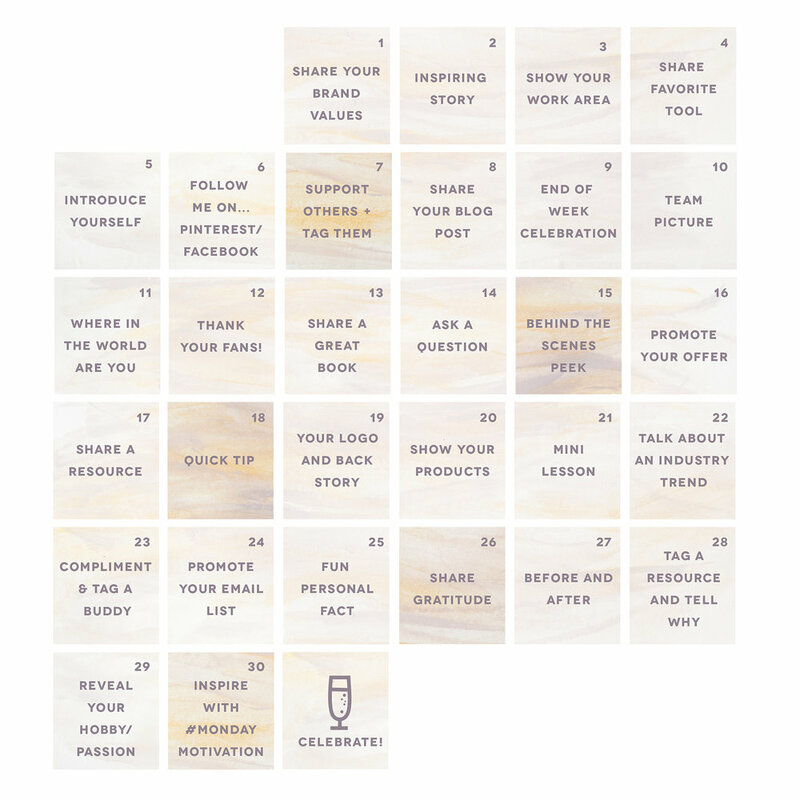 We know that it may not work for you to post daily, but start off by trying the 30-day challenge and see what content your audience engages with most. Next, transition to posting the five categories of content above, 3 to 5 times a week.